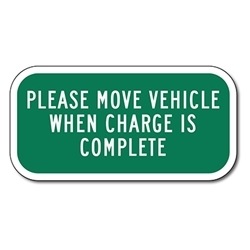 These supplemental signs go great as an addition to our EV Charging signs. There are three types of charging stations: Level 1 is the equivalent of a home plug-in and takes longest to charge an EV. Typically, Level 2 with 240V takes 5-6 hours to charge an electric car. While a Level 3 charging station with 480V typically takes 20 minutes to charge an electric car.